When a slot arrives based on a well known and sometimes feared movie character, well it is up to us at Boku Slots to investigate further. So, after discovering that NextGen Gaming had launched King Kong Fury we had to give the reels a spin. King Kong Fury is a 5-reel, 50 fixed pay line slot offering an RTP of 95.37%. Not as high as you would expect from NextGen Gaming, but we still hold out hope that the rest of the game makes up for the low RTP. You may notice the addition of dinosaurs and other ominous looking animals, meaning this game is set to the backdrop of Skull Island instead of New York City. Bet Amounts – Betting on King Kong Fury begins at 25p per spin and can be increased to the maximum of £500 per spin. Make sure you have adjusted the bet amount accordingly before hitting spin, as otherwise you may just end up betting more than you want too. Wild Symbol – King Kong himself is the wild symbol and he substitutes for all other symbols except the bonus. He will also only appear on reels 2, 3 and 4. In King Kong Fury the wild also features heavily in some of the bonus games too, so read on below for more details. Bonus Symbol – Ann Durrow makes your bonus symbol and by landing just 2 of these on reels 1 and 5, you will trigger the bonus spins feature. 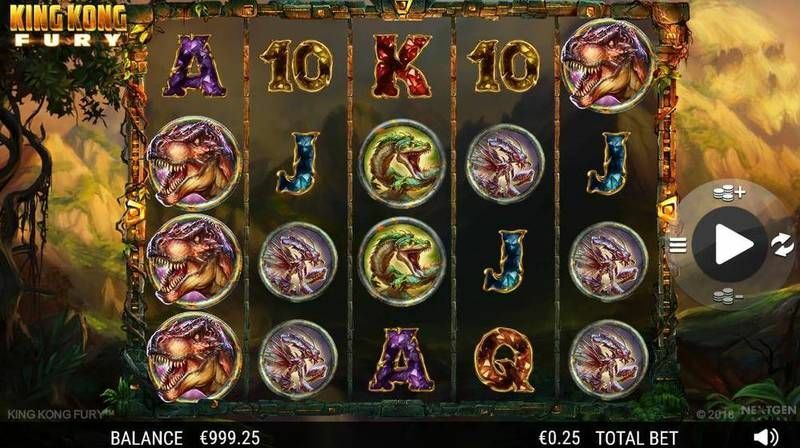 Lightening Reels Feature – Appearing randomly in both the base game and the bonus spins, this feature will add high value animal symbols to the reels. The lightening reel will show animals spinning inside and then will add up to 15 symbols to the reels, to complete any winning combinations. Kong’s Call Feature – Again appearing randomly in the base game and the bonus game, you will see the King Kong wild come into play. Kong will add up to 12 wild symbols to the reels, but only on reels 2, 3 and 4. These wilds will come in very handy to help complete bigger wins. Bonus Spins Feature – Upon landing two of the Ann Durrow bonus symbols on reels 1 and 5, you will trigger the bonus spins feature. When you press the spin button the pillars either side of the symbols will spin. Whatever numbers land on the pillars, they will be multiplied together to reveal your allocated spins. The maximum spins that can be awarded are 100 and they can be retriggered within the bonus game. During the bonus game you may be lucky enough to receive the mini feature Raging Respins. Raging Respins Feature – Only available in the bonus spins game, Raging Respins offers a great chance of bigger wins for players. If it triggers you will see a full reel of stacked wild symbols. A respin will take place with those wilds held on the reel for the spin. This means when the wilds land you can potentially win again on the respin, proving very profitable if it lands. 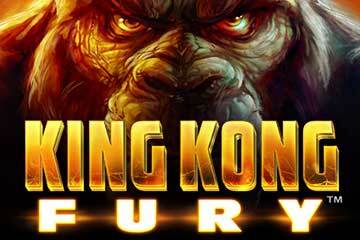 King Kong Fury is a fast paced game offering some amazing features and bonuses. Wins happen often enough, although usually at the lower end of the scale rather than the bigger wins; though they do occur if you are patient. We enjoyed the fact that the game took a lot of the themes from the movie and integrated them into the game as it melds quite well.